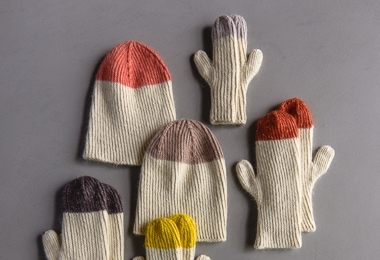 Our Twisted Rib Hats + Mittens will surely bring your winter a touch of color, plenty of warmth, and a ton of beauty! We knit our Twisted Rib Hats + Mittens in single-ply Flax Down, a pretty blend of baby alpaca, extra fine merino, and linen that from Heirloom White bottom to a colorful top glows with warmth and subtlety! Our Twisted Rib Hats + Mittens Pattern is sized from small babies to large adults, so everyone gets to be warm and cozy this winter! For more information, including materials, gauge, and sizes, please click Product Details, above. Main Color (MC): 1 skein of Purl Soho’s Flax Down, 43% baby alpaca, 42% extra fine merino, and 15% linen. We used Heirloom White. Contrast Color (CC): 1 skein of Purl Soho’s Flax Down. We made a Hat using every color in our Flax Down palette!